As the third and final summer evening club night to a members pond, on the 13 August 2014, we visited Tim Morphy's pond and new growing on house. 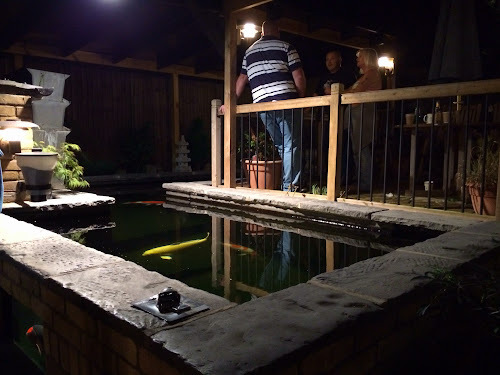 As with the other two members pond visits this year, this night was also really well attended with almost thirty members coming along to enjoy the great pond and hospitality of Tim and Sue. When Tim originally bought the house in Luton, the garden had a very distinctive slope towards the house. 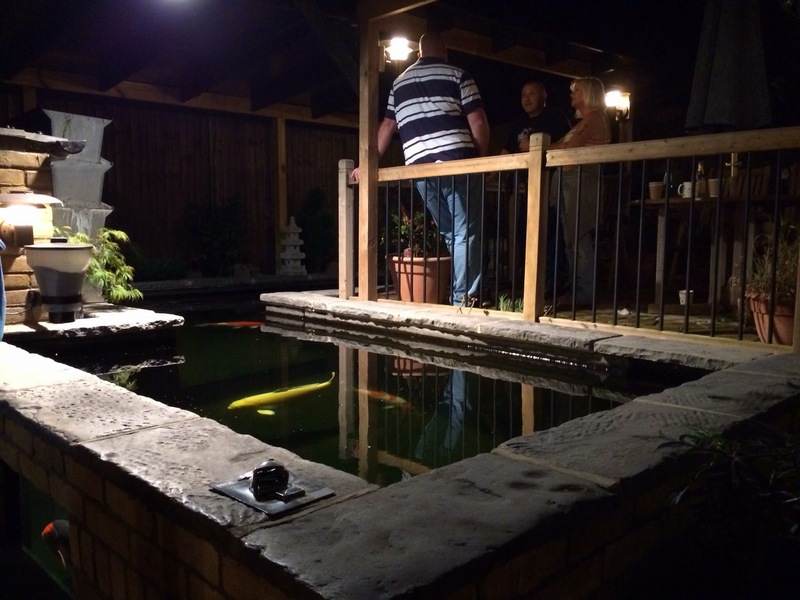 As a very clever bit of design Tim built a pond with raised walls including a window (above) that were about 4ft above the level at the back of the house. 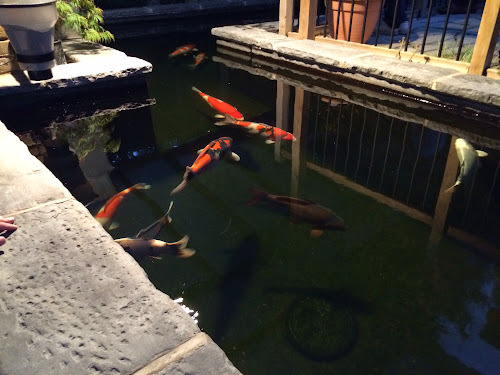 Having these raised walls enabled the top of the pond to become the basis for a new level garden. 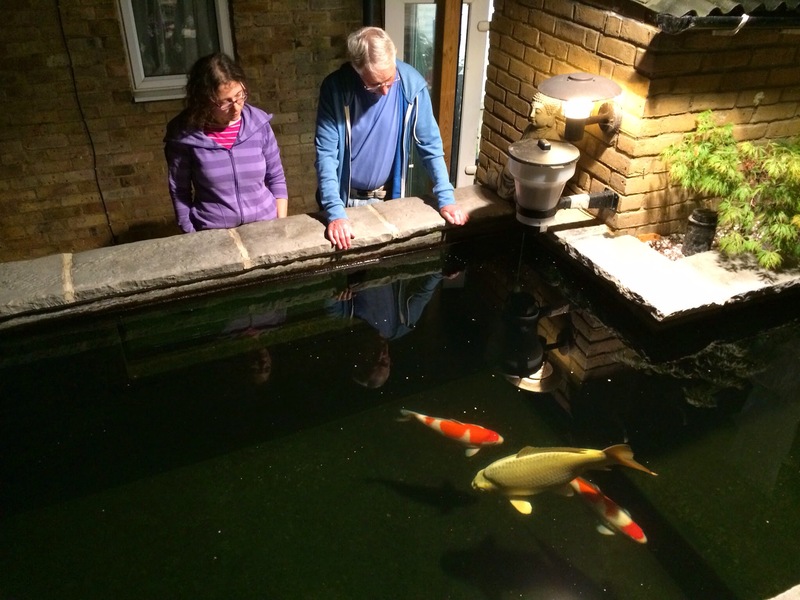 Tim's first pond was a rectangle that was 5.5ft deep, block built, with a bottom drain and fibreglassed hold about 3k gallons. 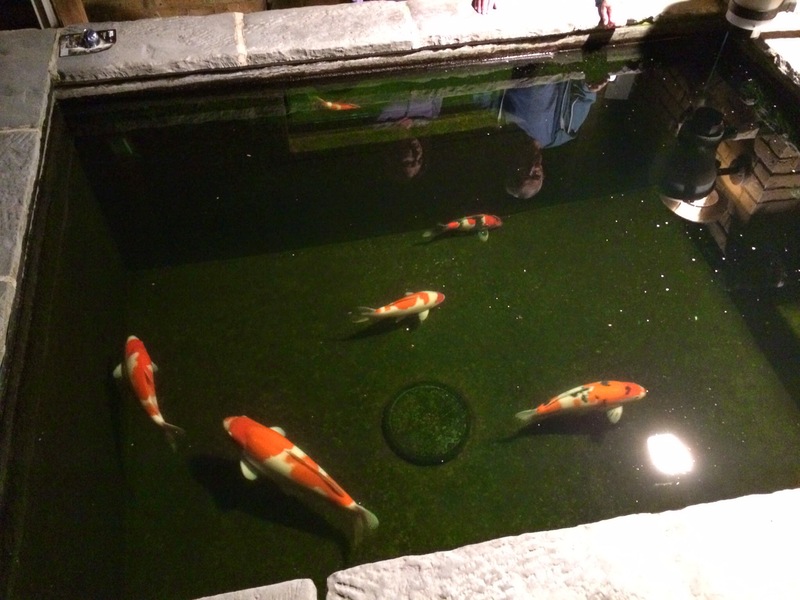 Whereas a number of members build the first pond, change it completely for a second pond and by the third / fourth build get the to right place, Tim didn't do that. During 2013, he went through huge addition to extend the pond. 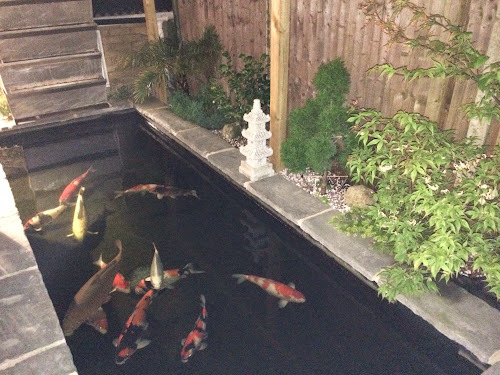 He achieved this by adding another rectangular pond at a right angle onto the corner of the existing pond nearest to the house. 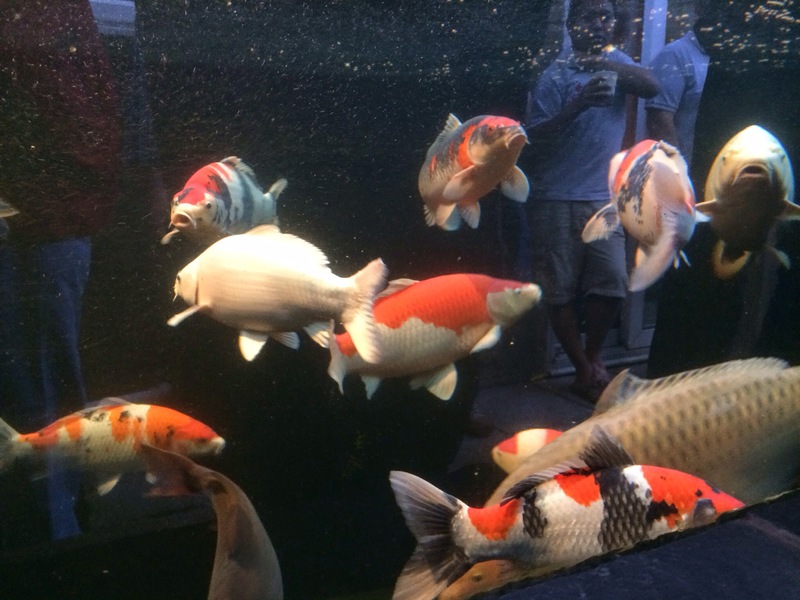 I have to say it worked extremely well the water clarity (not everything I know) is superb. The current filtration on Tim's pond is two bottom drains and a skimmer into the oase drum and then through a moving bed box filter. 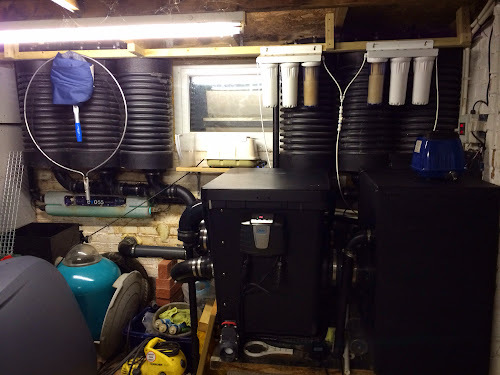 There are two outputs from the moving bed filter, one being pumped over three home made showers and the other being pumped through a UV then over another three home made showers (the black round drums on the wall below). This setup works well but Tim is concerned his current home made showers don't have the drop to gas off thoroughly. 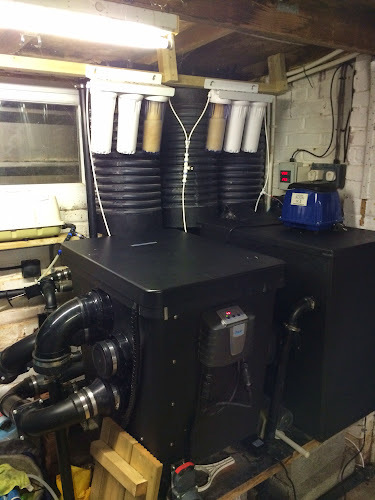 To address this he has recently purchased a 4-tier bakki shower with bottom weir exit that currently sits on the pond wall outside (top of the picture below). In the first half of this year Tim spent a significant amount of time, effort and money (I imagine) on a new growing on house. He did the majority of the building work himself to sensibly keep a control of the funding side. He managed to purchase the double glazed windows and door second hand (but in perfect condition) from eBay which was a fantastic saving. Interestingly Tim is not directly heating the pond water but is instead heating the room which in turn will raise the water temperature because he believes this to be more efficient. 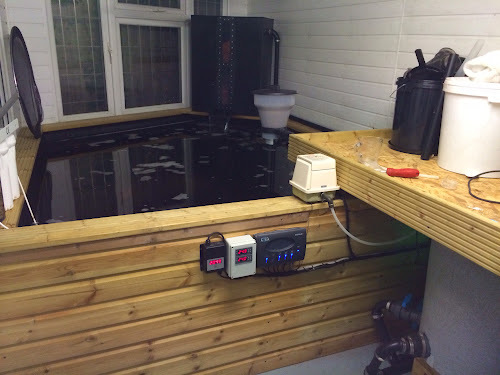 The filtration setup for this growing on pond is a bottom drain, into a gravity fed eazypod complete (with UV) and then pumped over a shower (top middle of picture). I feel this 2k gallon growing tank is a great addition to Tim's koi keeping hobby because it allows koi to develop in here for longer before being selected for the main pond or moved on. A huge thanks to Tim and Sue for opening up their house, garden and pond to the members of the Kangei club. It was another superb night! Our next meeting will be back in the main club house on the 10 September 2014 starting at 19:45. There will be a very interesting presentation by Bernie Woollands on the "Origins of Nishikigoi" which is a great way to start back into the club meetings.